There was once a village bred by evil. On the barren coast of Cornwall, England, lived a community who prayed for shipwrecks, a community who lured storm-tossed ships to crash upon the sharp rocks of their shore. They fed and clothed themselves with the loot salvaged from the wreckage; dead sailors' tools and trinkets became decorations for their homes. Most never questioned their murderous way of life. Then, upon that pirates' shore crashed the ship The Isle of Skye. And the youngest of its crew members, 14-year-old John Spencer, survived the wreck. But would he escape the wreckers? This is his harrowing tale. 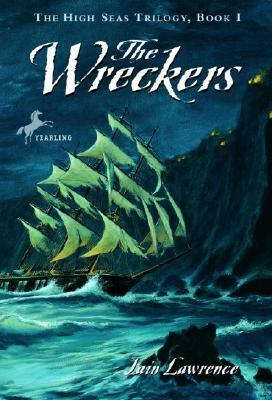 Iain Lawrence is a journalist, travel writer, and avid sailor, and the author of many acclaimed novels, including Ghost Boy, The Skeleton Tree, Lord of the Nutcracker Men, and the High Seas Trilogy: The Wreckers, The Smugglers, andThe Buccaneers. He grew up moving all over Canada with his family. He worked in logging, fishing, and even as a forest-fire fighter before studying journalism in Vancouver and working at newspapers for ten years. He is the author of fifteen books for young readers and has received many accolades, among them the Governor General's Award and the California Young Reader Medal. He lives in the Gulf Islands with his companion, Kristin, and their dog. He invites you to visit him online at iainlawrence.com.